MANILA, Philippines – The National Police Commission (NAPOLCOM) officially launched the Computer-Assisted Examination (NAPOLCOM CAEx) for applicants of the PNP Entrance examination which shall be held on June 29, July 6, 13, 20 and 27, 2018 at the NAPOLCOM central office in Quezon City. NAPOLCOM Vice-Chairman and Executive Officer Atty. 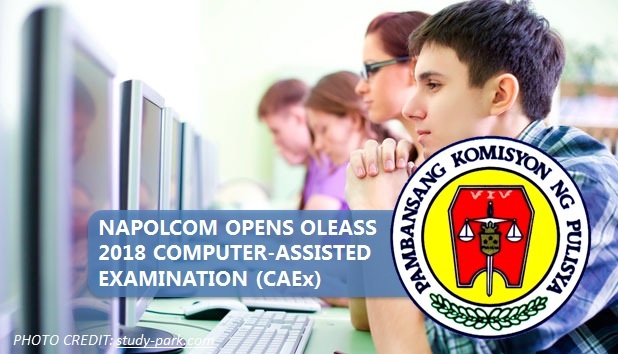 Rogelio T. Casurao said that applicants should get an appointment through the On-Line Examination Application Scheduling System (OLEASS) in the website www.caex.napolcom.gov.ph, which shall be activated on Monday, June 25. 2. Choose the desired date, fill out the mandatory fields and click SUBMIT. 3. A CONFIRMATION will appear if registration was successful. If not, the process should be repeated. 4. Applicant with confirmed schedule will be sent an auto-generated email wherein the applicant shall be required to access the on-link to enter all the required information in the application form. A printout of filled-out application form shall be presented by the applicant to the Examination Application Processor at the Examination Division One-Stop-Shop, 7th Floor, NAPOLCOM Central Office, EDSA corner Quezon Ave, Quezon City on the scheduled date together with the emailed confirmation slip.